System controls the doorstrike on an entry door. Standard method of operation: iButton. Keypad and iButton receptor unit mounts on exterior; enclosure mounts inside. Enclosure size: Steel enclosure with hinged lid, 12 inches x 12 inches x 4 inches. Input voltage: 110V or 220V AC. 12-volt backup battery in enclosure. Operating temp: 0° F to +158°F (-18° C to +70° C). Uses same software as CrossOver X15,	X25 and X45, which allows supervisors to set access by day or hour, as well as track the lock's use. Also can operate in a simple mode without PC software. The Lock Management Kit, which includes software and other items needed to program the lock. Only one kit is needed, no matter how many CrossOver Locks you have. 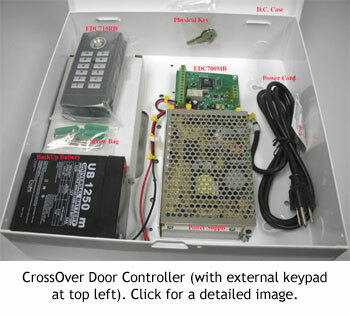 TimePilot Corporation guarantee*: If you are dissatisfied for any reason during the first 30 days after you purchase a CrossOver iButton Lock, CrossOver Door Controller or Solo iButton Lock from TimePilot Corporation, we will refund the purchase price if you return the lock and its accessories to us, freight prepaid and insured for the value of the system. If you choose this option, we hope that you will take a few minutes to help us understand why you're dissatisfied.Please be sure to call us for an RMA (Return Merchandise Authorization) number before returning the system. We can be reached at 630.879.6400 and Support@TimePilot.com.